Tesla Motors hit its first big road bump in months yesterday after Jalopnik broke the news that a Model S caught fire near Seattle after it crashed into some road debris, igniting the car's battery pack. Here's what we know so far, and why it may not be a big deal for Elon Musk. Yesterday's fire was significant and newsworthy because it was the first known incidence of a Model S fire on a public road. And even though gasoline cars catch fire after wrecks — or spontaneously, as is known to happen with Ferraris and other supercars — this event is likely to stoke safety fears about electric cars among the public and it is even credited with contributing to a decline in Tesla's stock prices yesterday. I am not convinced those fears are warranted. I'll recap what's happened so far, and then tell you why that is the case. What happened exactly? According to Tesla officials and the Kent Regional Fire Authority, the Model S drive crashed into what has been called a "large metallic object" in the roadway around 8 a.m. Tuesday on Washington State Route 167 outside of Seattle. The Tesla's alert systems signaled a problem, instructing the driver to pull over immediately. The driver exited without being injured but the car's battery packs were already on fire. What was the debris in the road? Unknown at this point. Tesla spokeswoman Liz Jarvis-Shean told Jalopnik that whatever it was, it was very large. The object caused significant front-end damage as it punched up into the battery pack underneath the car. What happened when firefighters tried to extinguish the blaze? According to fire department reports obtained by the New York Times and other outlets, firefighters attempted to extinguish the blaze with water, it made the flames worse. To quote our previous story, firefighters ended up putting out the blaze with dry chemical extinguisher. When they took apart the front end, they found a battery pack still burning. The firefighter "had to puncture multiple holes in the pack to apply water to the burning material in the battery," the report said. Firefighters also used a jack and cut into the frame of the car to spray water on the pack. Why is that? Fires in lithium-ion batteries can present many challenges for firefighters. The company issues a guide to first responders on how to extinguish blazes on their cars. A fire in a lithium-ion battery isn't just combustion, it is a slightly more complex chemical reaction. Tesla advises firefighters extinguish the fires using an ABC (dry chemical) or CO2 extinguisher. If the battery is breached, they are told to cool it with very large amounts of water. Battery fires can take up to 24 hours to fully extinguish, according to Tesla. Have fires like these happened before? 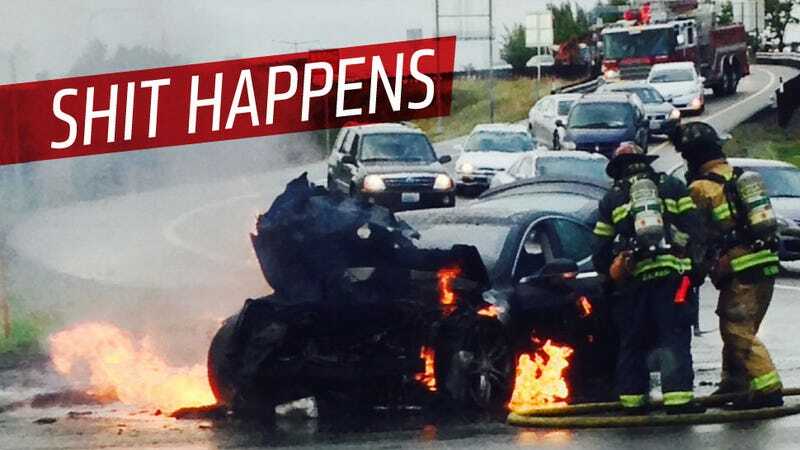 This is the first known incident where a Model S caught fire on a public road. The old Tesla Roadster was the subject of a recall for a potential fire hazard back in 2010 that involved its 12-volt battery system. The Chevrolet Volt was also investigated for potential fires following a series of fires after test crashes. No known Volt fires happened in public. The National Highway Traffic Safety Administration closed their inquiry in early 2012. Could it have been the 12 volt battery instead? Tesla doesn't think so; Jarvis-Shean told us the fire occurred in the lithium-ion battery pack, not the standard 12 volt battery that powers the lights, ignition, touch screen and other components. Why did Tesla's stock sink? Tesla's stock fell 6.2 percent yesterday, down to about 4 percent this afternoon. Two things have been blamed for this: a downgrade by R.W. Baird to "neutral" from "outperform" and then news of the Model S fire. It was a bad day to be Elon Musk, but it could have been much worse. Will there be a recall? That's tough to say. Jarvis-Shean said that is unclear at the moment. Often a recall investigation will be conducted by NHTSA, but they are currently not operating due to the government shutdown. An investigation could take place at some point. I thought the Model S was super safe. What's the deal? They are safe. In August NHTSA ranked the Model S as a 5.4 on the one-to-five safety scale, making it the safest car ever tested on their scale and possibly the safest car ever produced. Jarvis-Shean said that the fire is proof that the car's safety systems are effective. The car alerted the driver to pull over, and the fire breaks between the battery modules kept the flames from ever entering the cabin. "What this was was an affirmation of the safety design of the vehicle," she said. Is this a big deal for Tesla or for electric cars? The image of the burning Model S was certainly a jarring one, and it is the first black eye Tesla has received after a several month streak of rave reviews, super-high stock prices, profits, support from the public (if not elected officials) in their ongoing battles with car dealers, and the acclaim over safety. We'll wait and see if other fires happen after crashes, and whether a recall will somehow become necessary. In the meantime, I think these statistics speak for themselves, and I don't think one fire will dampen enthusiasm or demand for the brand. Update: Earlier today I asked Dr. Stephen Granade, physicist and friend of Jalopnik, to help explain the difference between a lithium-ion battery fire and a gasoline engine fire. Here's what he told us. The thing about lithium ion batteries is that they can catch fire on their own in a way that you don't see with gasoline in a car's tank. It's actually really hard to make gasoline burn without introducing flames. You have to heat gasoline up to around 500 degrees F before it self-ignites and undergoes what chemists call "thermal runaway", where the gas is producing more heat than it's losing to the gas tank or the air around it. Lithium ion batteries, however, can experience thermal runaway at temperatures as low as 200 degrees F. Now, it can take days before the battery will catch fire, but it gives you an idea of how much easier it is to get a lithium ion battery to catch fire than it is with gas. Thermal runaway happens because the poles of the battery, called the anode and the cathode, are highly reactive. They undergo reactions that give off lots of heat, and as they heat up the reaction happens faster and faster. Lithium ion batteries are popular because they can carry a lot of energy. Their energy density — how much energy you can store per pound of battery — is really high. But that means that they have a lot of energy that can be converted into a spectacular fire. Even worse, they're filled with a highly-flammable material that's under pressure. When you draw electricity out of one of these batteries, lithium ions carry electrons from the anode to the cathode to give you an electrical current. The lithium ions move through something called an electrolyte. The electrolyte separates the anode and the cathode but lets the ions move from one to the other. It just so happens that the best electrolytes for lithium ion batteries are also really flammable. What probably happened to that poor Tesla S is that the debris in the road crunched one or more of its batteries in a way that made a direct electrical path between its electrodes. When that happens, it's like dropping a crowbar across a car battery. Electricity flows freely and the battery gets a lot hotter than it's designed to withstand. High-capacity batteries like the ones in the Tesla S have multiple cells in them so that they store more energy. Each cell is like its own mini battery, kind of like how you have to put multiple AA batteries in a flashlight. A fire in one cell can cause the surrounding cells to overheat and catch fire, and pretty soon you're off to the races. This is a known issue, and is why lithium ion battery manufacturers do everything they can to make their batteries withstand damage and they firewall off individual cells to keep thermal runaway from happening in the whole battery. Tesla also puts firewalls between individual battery packs for the same reason, but if you get a hot enough fire, then all of the cells in all of the batteries will burn. I've heard talk about how water didn't put out the fire because lithium ion batteries have lithium in them, and lithium catches fire when you expose it to water. It's true that lithium catches fire in water, as I accidentally proved in one of my chemistry labs. But there's very little free lithium in the batteries. Instead the lithium is either shoved inside the anode and cathode material or is bound up as a salt in the electolyte. Water won't make a lithium ion battery catch fire. What I'm guessing happened is that the firefighters put out the parts of the car that were burning, but didn't shoot enough water up under the car to cool down the batteries and stop the thermal runaway. That would let the batteries keep burning inside until the whole thing re-ignited again, possibly worse than before if more cells in the battery had also caught fire. I saw in the accident report that they were able to put out the fire by applying enough water directly to the battery pack's insides to bring down the temperature and put out the flames. Tesla's own directions to first responders states that, if the battery is on fire, it needs to be cooled down with plenty of water.